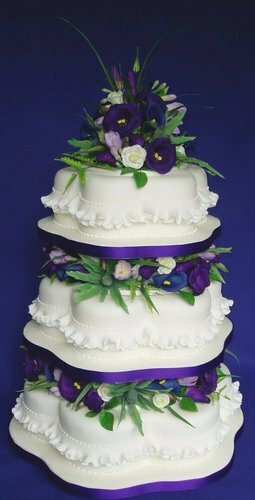 A beautiful three tiered stacked petal shaped wedding cake. Stunning sugar flowers including Lisianthus, Freesias, Cala lilies, Sea Holly and Roses are nestled down between the tiers and crown the cake. Delicate frills are wrapped around the sides completing this elegant design.